Neighbors coming together to plan, design, and implement ways to use public art and urban design to cultivate vibrancy, build ownership, and create a sense of place along Payne Avenue. Payne Avenue in the Campus District, is a highly-trafficked area. Cleveland State University students traverse it to get to their apartments and athletic fields, hundreds of Norma Herr shelter residents travel the street everyday, and with the new Campus International School building in the neighborhood hundreds of students walk the street as well. Despite this, the current urban landscape leaves a lot to be desired. There are no places for people to comfortably sit, there is little that is friendly or engaging on the street. But all these challenges are opportunities for members of our community to create place, meet new people, and bring some vibrancy to the area. So we are working with Campus International School students, Norma Herr homeless shelter residents, local artist Guy-Vincent, and Across the Lines Community Arts Space in the Superior Arts District to come together to plan, design, and implement ways to use public art and urban design to cultivate vibrancy, build ownership, and create a sense of place along Payne Avenue. We have received grants from Cuyahoga Arts and Culture (CAC) and Dominion Energy to complete this project. We are fundraising to meet the rest of our project needs. execute it. The inclusion of the lead institutions in the neighborhood and student body showed me a deep understanding for how you intend to effectively influence change in the neighborhood." 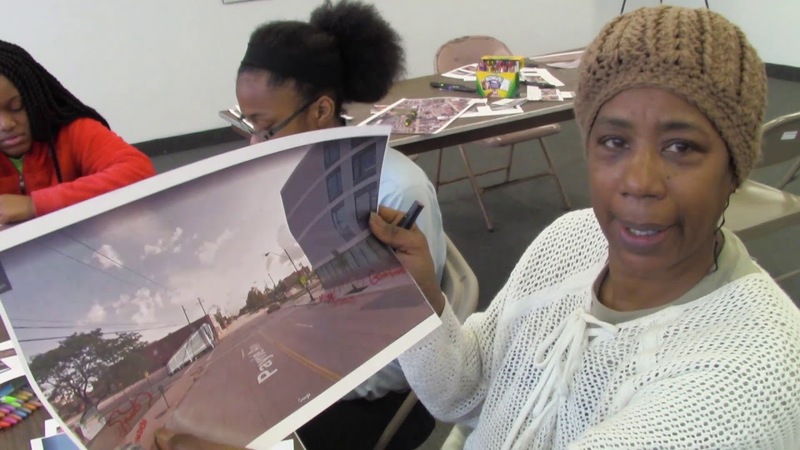 February 2018: CDI and CIS students work together with Norma Herr residents to talk about design principles and improvements that can be made on Payne Ave. Students will film a fundraising video about what they learn. June 2018-Ongoing: CDI Works with Across the Lines, a community arts space located in the ArtCraft building to begin offering arts classes to Norma Herr guests. Fine artist, Guy-Vincent, co-leads the workshops with Jane Finley. January-February 2019: ATL, CDI, and Guy-Vincent host joint workshops for Campus International School 5th graders and women from the Norma Herr art classes (at ATL) to create a joint peice of artwork that will be placed on the Campus International School--a companion peice to the one in front of the shelter. May 2019: All benches, waste recepticles, planters, and public art peices will be installed on East 22nd and Payne Ave.
May 2019: Celebrate our new community connections and newly beautified intersection! This process will build meaningful connections between members of our community and the result will add a sense of identity, an element of comfort, and fun to the neighborhood. Our project partner, Across the Lines- a local community arts space, is featured in this edition of the Campus District e-news! Read about the wonderful work they do and the collaborative work we have been doing together with 5th graders from the Campus International School and women experiencing housing emergency staying at the Norma Herr Women's Center. Learn more HERE.